The Thorthormi glacial lake in northern Bhutan is considered the country's likeliest climate-induced disaster. The lake, perched at a height of more than 4,400 metres, is swelling because of melting ice, and is in danger of bursting its wall. Efforts by the Bhutanese government to lower the lake's water level is yet to eliminate the risk of a disaster, which may sweep away communities living in the upper catchment of the Pho Chu river, fed by the glacier. 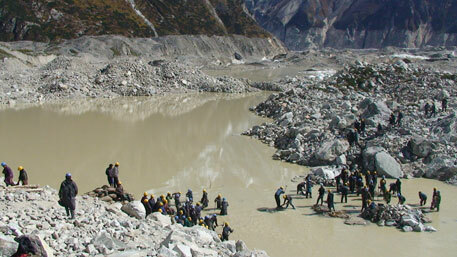 It was in 2008 that the Bhutanese government decided to start an operation to reduce the possibility of a glacial lake outburst flood or GLOF (see 'What is glacial lake outburst flood') after Bhutan’s first proposal to artificially lower the Thorthormi lake was accepted under the national adaptation programmes of action (NAPA) in 2006 (see 'Climate adaptation aid to poor countries'). Under the project, supported by the United Nations Development Programme among others, the government aimed to lower the water level of the lake by five metres or 17 million cubic metres of water in four years. The decision followed a study which showed the lake was expanding and if the lake bursts, it would threaten communities in the Punakha-Wangdue district and Choskhor valley. The international mission, led by Bhutan's department of geology and mines, to mitigate the risk posed by Thorthormi lake ended in November 2011; the team deputed to accomplish the mission is back after the third and final phase of the project. But the mission is far from accomplished. Operation Thorthormi was delayed by a year and the actual work on it started only in 2009. Since then, the water level in the largest glacial lake in Bhutan, measuring 3.42 sq km was reduced by 3.68m, 1.32m short of the target. The team members of the mission confirm that Thorthormi lake and other ponds in the Thorthormi glacier are expanding. A past study conducted with old satellite images of the other lakes in the same vicinity showed that annual retreat rate of the glacier is about 30-35 metres each year. A glacial lake outburst flood (GLOF) occurs when the dam blocking the glacier's path collapses. The dam may comprise glacier ice or a terminal moraine (eroded material from the sides and bottom of a valley, which the glacier pushes to the front). The collapse may occur due to erosion, build up of water pressure, an avalanche, heavy snow, earthquake, volcanic eruption under the ice, or if a large portion of a glacier breaks off and massively displaces the waters in a glacial lake at its base. When the outburst occurs, water dammed by a glacier or a moraine is released. A water body that is dammed by the front of a glacier is called a marginal lake, and a water body that is capped by the glacier is called a sub-glacial lake. Glacial lakes may hold millions to hundreds of millions of cubic metres of water. Catastrophic failure of the containing ice or glacial sediment can release this water over a period of minutes or a few days. Peak flows as high as 15,000 cubic metres per second have been recorded in such events, suggesting that the v-shaped canyon of a normally small mountain stream could suddenly develop into an extremely turbulent and fast-moving torrent some 50 metres deep. In a downstream floodplain, the inundation may be somewhat slower, which may spread up to 10 km in width. In either instance, threat to life and property is very high. The national adaptation programmes of action (NAPAs) under the United Nations Framework Convention on Climate Change (UNFCCC) provides a process for least developed countries (LDCs) to identify priority activities that respond to their urgent and immediate needs to adapt to climate change. NAPAs are action-oriented and country-driven, based on the national circumstances and receive fund support from LDC Funds (LDCF). LDCF was established under the climate convention decision at the seventh Conference of the Parties (COP) to the UNFCCC, held in October 2001. It is meant to meet the urgent and immediate needs of the LDCs, which are among the most vulnerable and those with less capacity to adapt. The COP requested the Global Environment Fund (GEF) to manage LDCF and to mobilise resources to finance the preparation and the implementation of NAPAs in all such countries. Glaciologist with the mines and geology department and a member of the mission, Karma Toeb, says the project was delayed by a year because “2008 was spent on revisiting the earlier technical mitigation plan”. 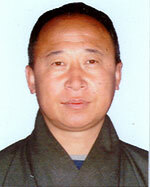 Now his department is trying to get the mission extended by one more working season to 2012. “If the time is extended, we’re optimistic of achieving the target,” he adds. The mission was a difficult one. The work site was hard to reach and transporting machines there was impossible. The work was done mostly manually by deepening and widening the already existing outlet channel through Thorthormi glacier to drain the lake's water. Big boulders were broken down using silent explosives, which were then removed manually. The team also lowered the water level of two subsidiary lakes by 1.1m. The team comprised 17 government officials and 360 workers recruited from from Lunana village. But lowering Thorthormi's water level by five metres may not be enough. Toeb says the project doesn’t aim to prevent the glacial lake from bursting, but reduces climate change induced risk and vulnerabilities. “We cannot stop glaciers from retreating as long as the global temperature keeps increasing,” says Toeb. “There are chances of huge moraine dam glacial lakes forming, which have the potential to burst in future.” The threat is not only to Bhutan; these lakes pose a risk to neighbouring countries like India, too. For instance, the 1994 GLOF from Lugge Tso (lake) showed a number of impacts on Assam by way of flood level rise, says Toeb. Toeb says the Thorthormi lake is expanding every year. The mission team witnessed huge ice blocks detaching from the main glaciers and plunging into the Thorthormi, identified as the most dangerous lake among the four main lakes. “When the lake (Thorthormi) expands, it’ll increase the hydrostatic pressure, which in turn will exert pressure on the moraine dam (eroded rock and debris pushed by the glacier to the front),” says Toeb. If this happens, then the risk is water from Thorthormi will spill over to Rapstreng and both lakes will burst out. Artificially draining the lake is one method of reducing risk; preparing hazard zone maps of the downstream region to study the impact of flood, if it occurs, is another. “Both has been done in the Puna Tsang Chu (the river into which Pho Chu river flows) basin, and in addition government has also installed early warning system to warn the people in case of GLOF in the river basin,” says Toeb. Government officials say they will try to extend the mission period, but that would depend on funds availability.